All the way from Norway. Thank you! Kuala Rompin is World Class! 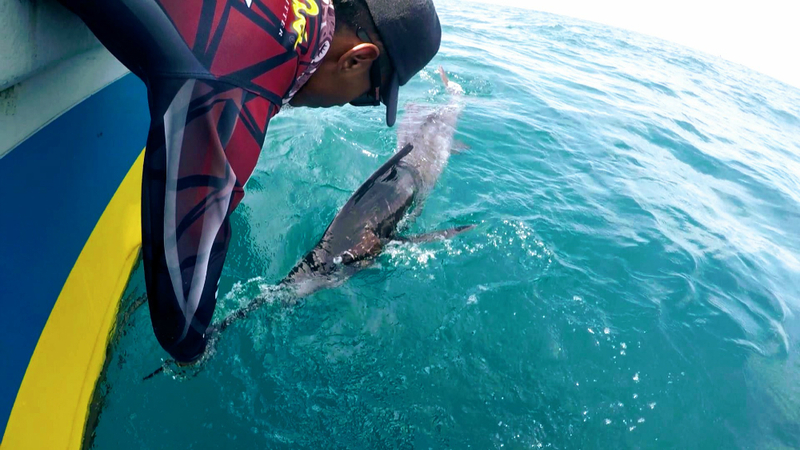 Off-season Sailfish fishing in Kuala Rompin proves to be one of the most challenging fishing expedition. It can go either way. On good day you lived up and claim your glory or on the bad day, you end up catching nothing. I’ve seen report mid year Sailfish fishing by LXF and it seems to be at a very steady number. 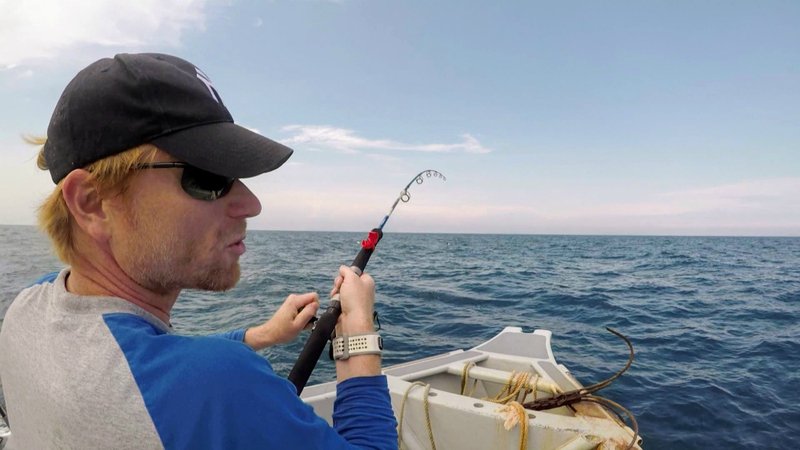 Back in April, I’ve got an email from Tom, wanting to go out fishing for Sailfish in June. It was going to be a special trip as his friend Arne will be visiting Malaysia for some extreme sports fishing. We setup 2 days and hopefully that it will be enough to chase some Sailfish. As we were about to kick start the day. One of the twin engine were not firing. It took us about 30 minutes to sort it out. The engine were not in Neutral. As soon as we got it fixed, we straight away and dashed to find some live bait. We started the day with some information that we have over last weekend. 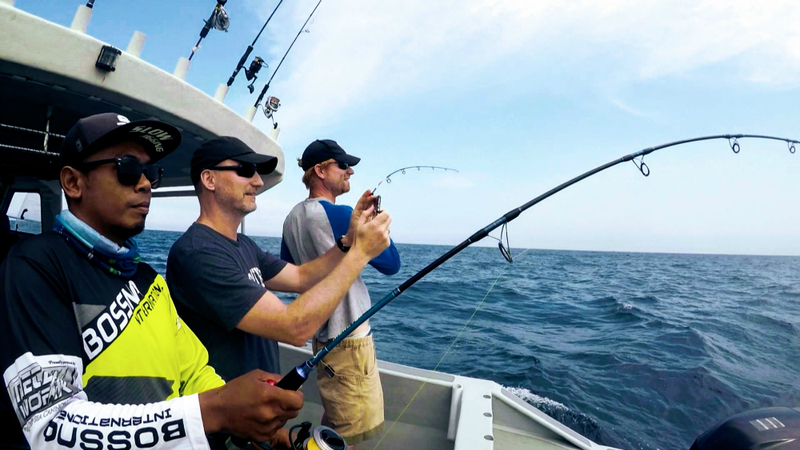 Talking about past information, fishing can change from day to day basis. We head out towards South, towards Tioman. We came across Andrew Griffin’s team as they went out with Anthony for the weekend. They only encounter Mackerel and no Sailfish yet. Another boat radio in, and pointed a flock of birds about 5 miles towards inshore. 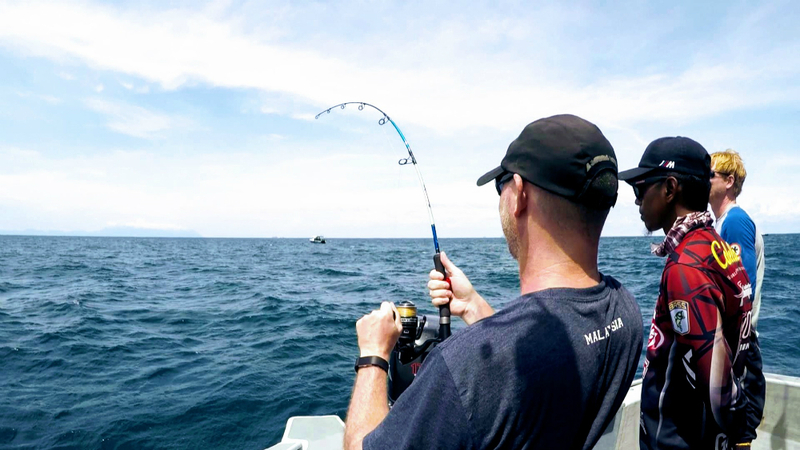 Since we have a handful of good bait with us, we decided to check out the location and found ourselves a group of Sailfish encircling small bait-fish. As we are in a position to let our live bait out, the current and the wind seems to go at a different direction. Putting us in an awkward position. Bait Direction will be heading towards a different direction. Even if we wanted to anticipate their position and hoping that we will get in front of them was a difficult task. 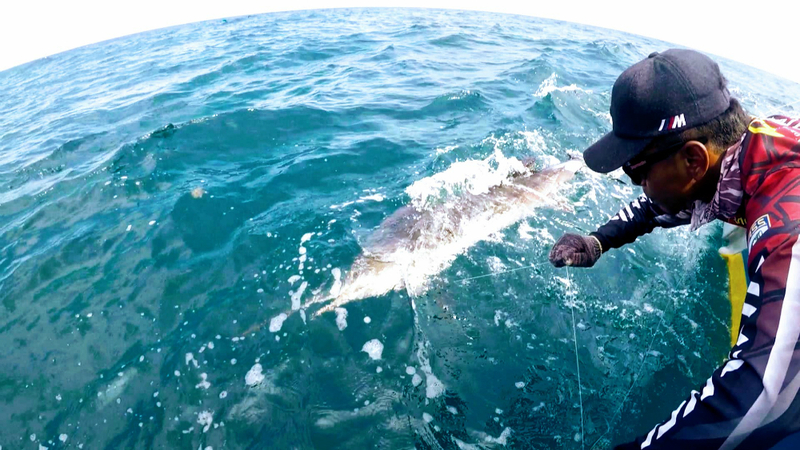 In the end we skunked the first day and Andrew’s group were doing great with 10 Sailfish. We knew where they were and I don’t think we put a foot wrong when it comes to grabbing an opportunity in-front of us. We only had 4 take but we couldn’t hook even one. The size was too small and they are easily spooked when we were close to them. We had our 4 chance because we do the trolling with live-bait. It was a bit worrying to be honest when we don’t score anything on day 1. Dead silence. Arne was with us the whole fishing time. Some how he knew that this was not going to be a good day. We keep our spirit high with some excellent Chinese cuisine in Rompin River Seafood restaurant. Hoping that tomorrow will be a better day. Day 2… Now it’s Fun time..
We head out early on the second day. Hoping to increase the number of hours available to hunt down Sailfish. We followed the coordinate given by Ah Pui, AG’s captain for the weekend. Hoping that the Sailfish would still be there. We followed the same routine. Bait-fish fishing in the morning. Stock up as many fish as we can before we down to an Unjam situated close to Tioman. We followed the coordinate but could not find the Unjam on sight. Andrew’s told me they saw a flock of birds encircling the Unjam. Well this morning, nothing indicate birds within the area. We press on further out and finally came across an Unjam. This could be the location or some place close by. I cast my pintail out, as I was on a fast retrieve. DUB! A fish took it and cut the line. Tied another one and again cut off. Shafiq our new deck hand throw out a live bait and it was taken in less then a minute. By the look of it, this one is a Sailfish. Arne tried his best to land it on a very light Tenggiri tackle. In the end the line snapped. We tried again and this time double hook up! But I guess I was too anxious on setting the hook and both fish manage to get away. Finally for the third time and this time slow and steady. We hooked on to our first 2 fish! FISH ON! 2nd Double Hook.. we just lost two like in 5 minutes ago.. Starting from the back and to the front of the boat. This first Sailfish is a bit cheeky. 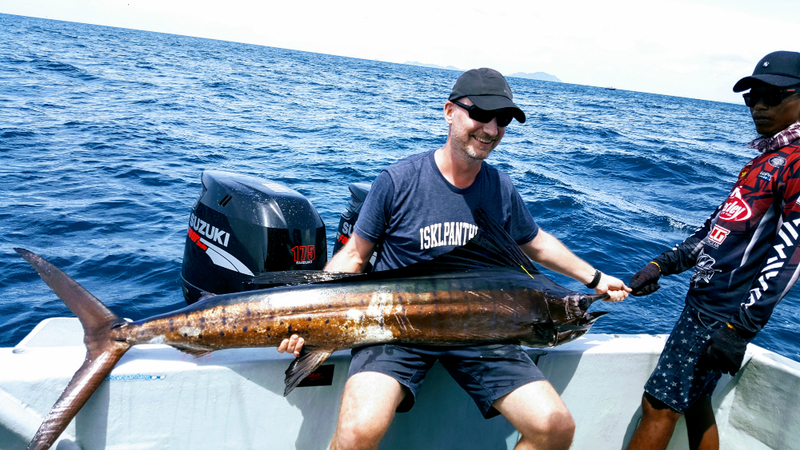 Arne finally got his chance to land his first Sailfish in the South East Asia region. 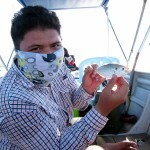 Previously, he has done his Sailfish fishing in Australia. The battle rage on.. minutes after minutes. This one is not coming home easily. Both contenders traded heavy blow hopping to topple their opponent. Surprisingly, our first Sailfish were in control. At times, it does seems to just relaxed and regain its energy before dashing to break free. Arne was not giving up either. 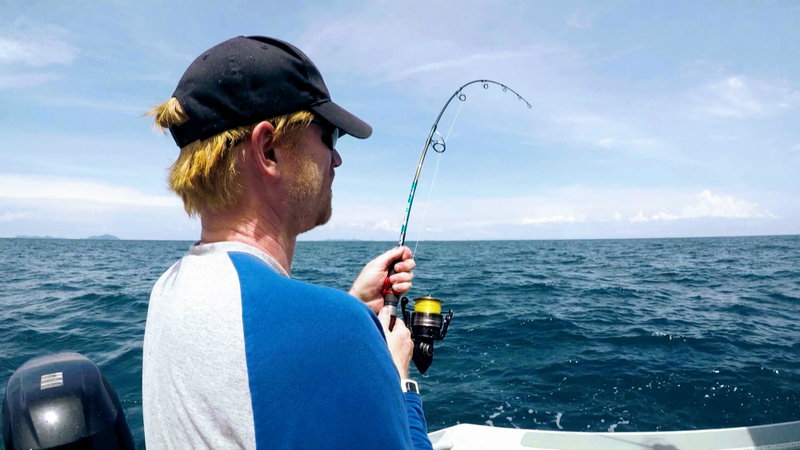 He came all the way from Norway and now his is in the hot seat to land a massive Sailfish. Right about 20 minutes, Arne got the upper hand. Finally the fish seems to gave up and Arne were gaining a lot of line until Shafiq grab on hold on the leader. The fish were hooked at the belly and that’s why the fish were able to put up a great fight. It was able to controlled his head, feed more oxygen in. By the time he got his energy pumped up again, it swims away. Almost got it! But our first one was a tough fighter. It wont go down easily. After another 15 minutes. Finally it decided to give up. Arne was bringing it home with easy and TX put a hand on to its bill. We recovered it for a bit before taking it up for tagging and photo opportunity. All of our hard work paid off. All the burden have been lifted from our shoulders. Its time to press forward an enjoy a good day at sea. With 2 more boat came in and join the Sailfish frenzy, it has becoming a small tournament. One of it is Patrick Erler’s LXF Boat and Anthony’s Boat. All focusing on maximizing our fishing outing for the day. Booyah! No 1! What a relief for Team Fishyology haha..
Sailfish need to be properly recovered before release. Especially after a long fight. The rest is history that afternoon. We end up with 7 Sailfish on board and manage to tagged 5 with FishnTag Tag. Arne has lived up to his dream. 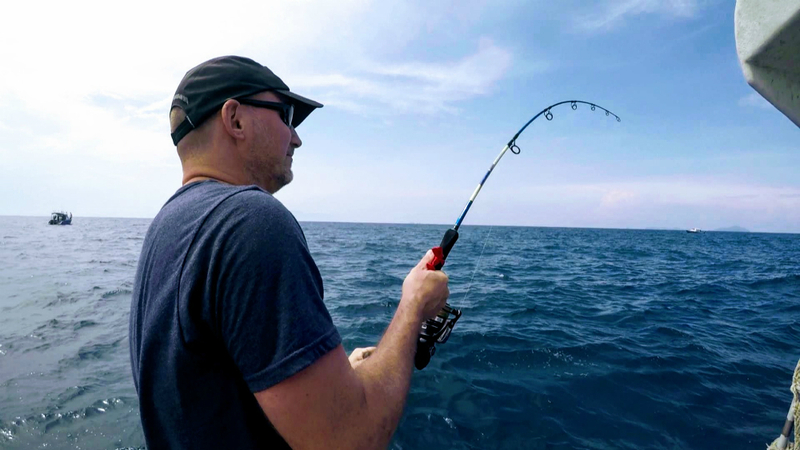 He was badly battered by the fearsome power of this wonderful game fish of Malaysia. Bite rate has been great all day long. As long as we start throwing bait as close to the Unjam or FADS. 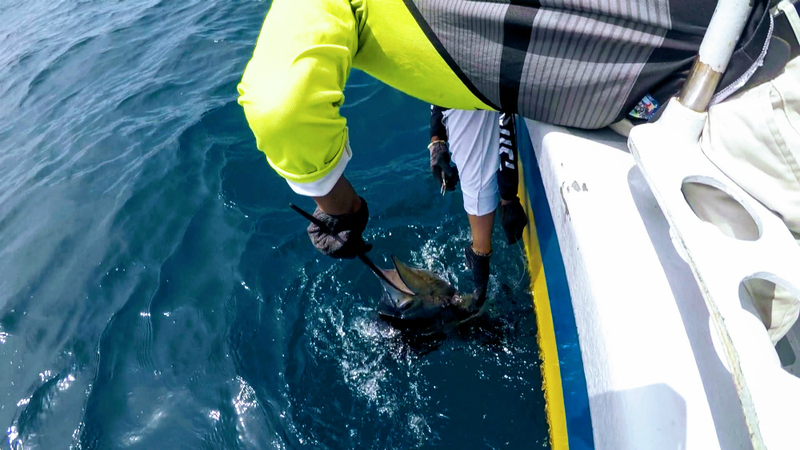 We even manage to save one Sailfish from being tangled on the Unjam line. It was a time consuming process and we did anyway just because we respected the species. It can’t be treated like a toy. It fight for its life while we were having fun in catching them. Once it is free. We pickup our gear and get back to the game. Good vibe! Tom Arne Bakken. 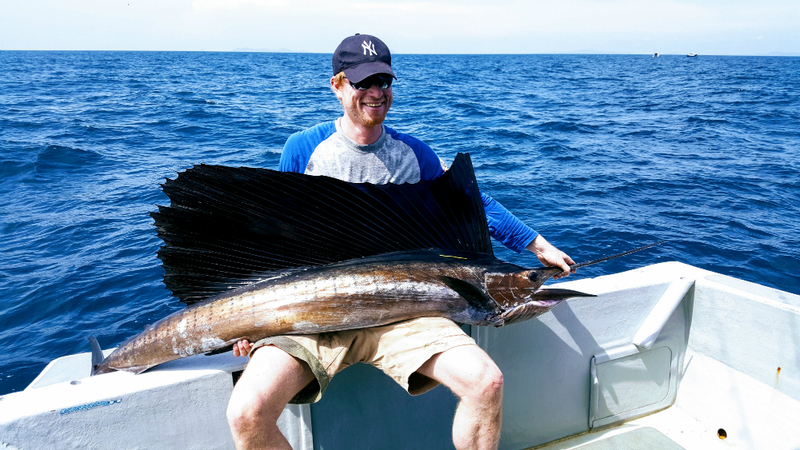 Master of Sailfish. Gracefully scoring his first Sailfish of the day haha. Another massive Sailfish! Tom the one and only Sailfish landed that day. Another run maybe.. but lost it in the end as the fish jumps and break off the line. One thing I like to get anglers involved is experience the moment to hook the fish. It is a special feeling. You will fell the line spilling out freely. Sometimes a fast dash as the fish swims away with the bait. Or even a slow and steady line outflow and a sudden sound of WHOSHH! as the line strip the surface of the water. A sign that a Sailfish is about to jump out of the water. So, one last Sailfish before we head in. Arne got his bait out and hand on the line. Waiting patiently for the fish to take the bait. The moment he feels the fish took the bait, he just let the fish take with it. Patiently waiting for the right moment, and all he needs to do is lift the rod and tighten the tension. Game ON! One last sailfish! Last one for Arne before we head home. Fantastic job guys! Thank you for coming to Kuala Rompin! 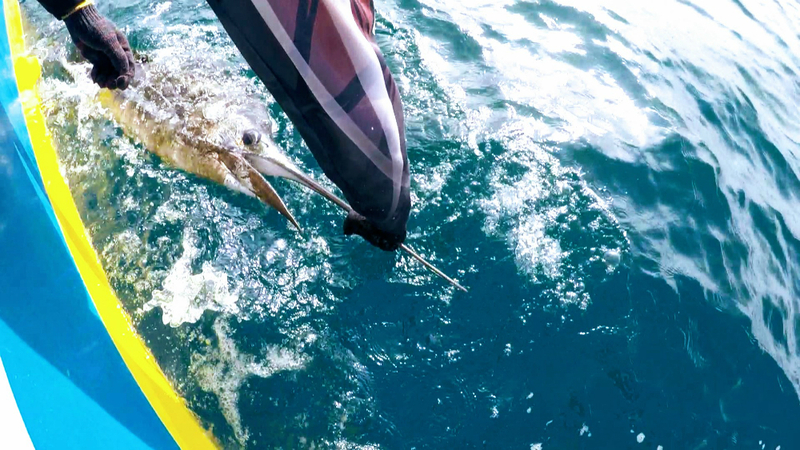 In total that weekend, 3 boats caught 35 Sailfish. 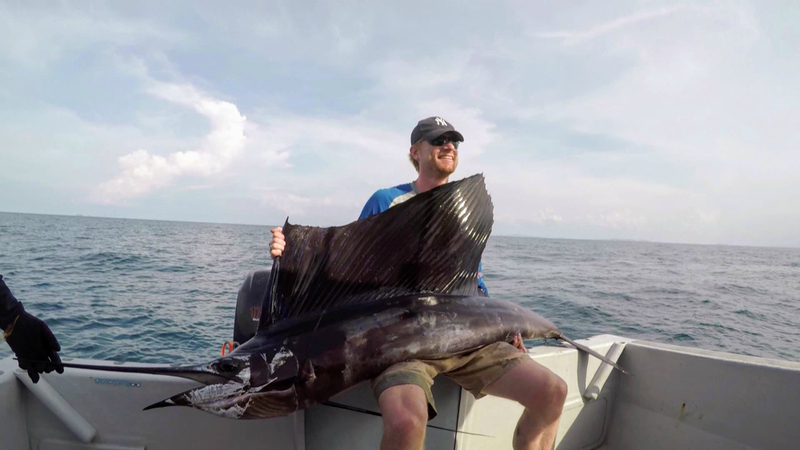 Andrew and Jochen caught a massive 60kg and 70kg Sailfish respectively. Awesome weekend and hopefully it will be even better during the open season in August. Thank you to Tom and Arne. Hopefully we will see you again next year.